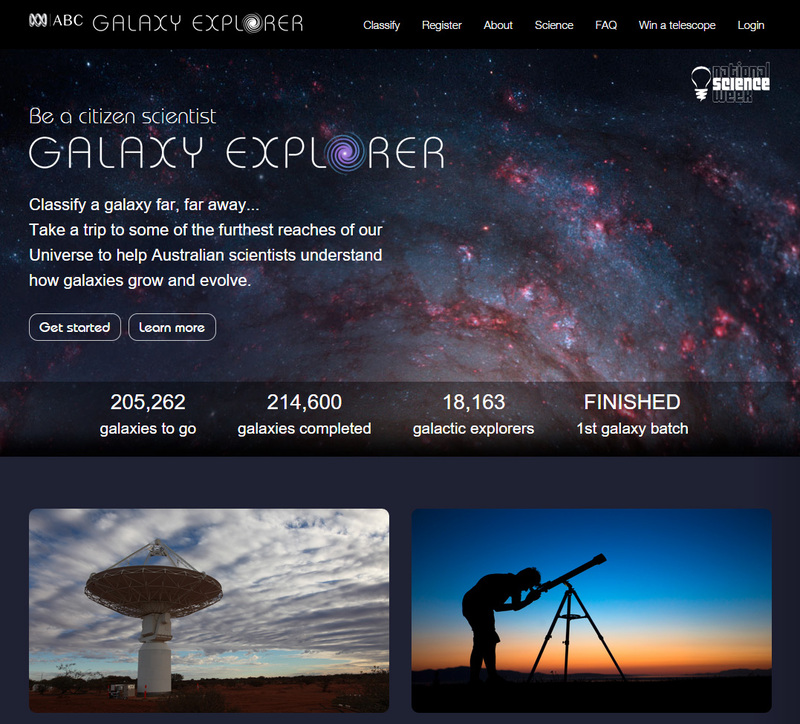 ABC’s National Science Week citizen science project Galaxy Explorer has been a huge success, with every single one of the 220,000 galaxies in GAMA batch classified by the minimum of five different users (to exclude inadvertent or malicious misclassification), for a total of over one million classifications! Galaxy Explorer had 18,163 registered participants, which averages out at 55 galaxy classifications per user. As at 27 August the highest number of classifications done by a single user was over 17,000, and the most for a school group was 12,000! That single user figure is incredible, but let’s just hope they weren’t compromising quality in the pursuit of quantity! The Australian national broadcaster is getting into the spirit of National Science Week (15-23 August 2015) with a project that gives citizen scientists an opportunity to identify and classify galaxies. Called ABC Galaxy Explorer, the website supports the Galaxy and Mass Assembly (GAMA) project, which has over 200 thousand images of galaxies between 800 million and four billion light years away. The GAMA team needs the help of citizen scientists due to the sheer volume of imagery that needs to be processed to provide a useful data set. Data will be used to build a model of how the galaxy population in the universe has evolved. Up for grabs for participants, are two Celestron 90GT WiFi 90mm (3.54″) refractor telescopes.